Electrolysis is a safe, effective, gradual and permanent method of removing unwanted hair. It is the only genuine permanent method of hair removal, and for that reason, a treatment in great demand. A fine probe is inserted into the hair follicle, where a combination of heat and galvanic current is introduced and targeted at the root of the hair. The hair is then removed. As the hair grows back between treatments, it will become weaker and finer, and after repeated treatments, the hair will no longer be able to grow. Electrolysis is the removal of hairs one by one from any area of the body, although it is not really suitable for large areas as each hair is treated individually. The root of the hair is hit with a tiny pulse of electricity which is delivered through a very fine needle inserted into the hair follicle by the therapist. This pulse destroys the follicle root and prevents the hair from growing back. Many treatments may be needed for each area as the hair has various stages of growth and is best treated at certain times in the cycle; it is also a lengthy process so repeated sessions are more practical. If it is your first time having electrolysis your therapist will discuss any questions or concerns that you may have before starting the treatment to ensure you are at ease. 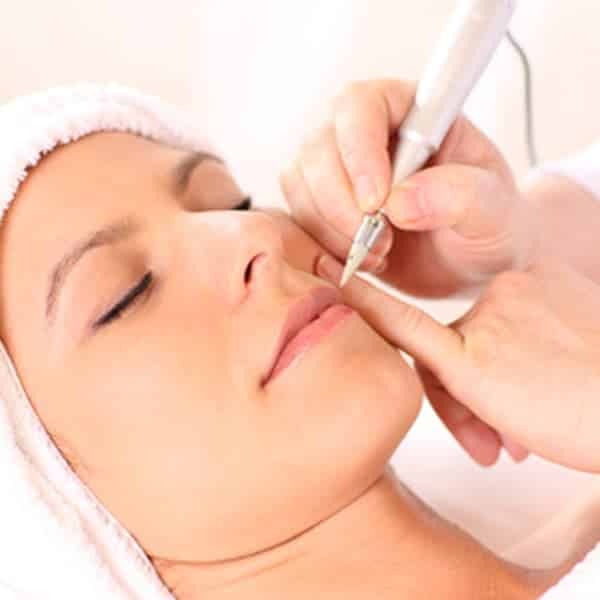 There are three different methods of electrolysis: Galvanic, Thermolysis and Blend. The first uses a person’s body as an electrolytic cell, the second uses electrical heating and the third a combination of the other two. The methods all work in the same way by delivering an electric pulse to the base of the hair shaft. You will not notice any particular difference whichever method is used. The process can be lengthy depending on the amount of hair being removed, and its properties: coarser hair will take more treatments to remove it for good, and as the therapist must treat each hair follicle a larger area will take more time. Once a course of electrolysis is started it is important to stick to the schedule or all the previous sessions will be wasted. This type of hair removal is permanent if done correctly and for sufficient treatments. Some people do experience some pain but most do not find it unacceptable and some hardly feel the needle at all. Completing a course of electrolysis removes not only the hair but also the need for waxing, tweezing and plucking, at least on the treated area, and the vast majority of people suffer no side effects. If they do it tends to be a temporary reddening of the skin. Scarring can occur but only in the hands of an untrained person so it is best to leave the DIY electrolysis kits at home and come to the Belmore Centre in Aylesbury for a comfortable and safe session of hair removal. Electrolysis can be used on all skin types and colours, and most areas of the body, but it is not the best way to remove hair from large areas simply because of the time and effort involved. Electrolysis is perfect for those little, annoying patches of hair that remain unnoticed until you bare all in the summer; toes and bikini lines, underarms and facial hair can all be treated with little zaps of energy. Imagine the joy of never having to have a bikini wax or shave your underarms again, and no sudden realisation of the bits you have forgotten as you stretch out on the beach. Thanks to electrolysis, every future sun holiday will be filled with smooth, sun-kissed skin.